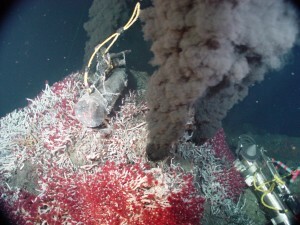 Black smoker hydrothermal vents and the unique biological communities they support are spectacular manifestations of the effects of the hydrothermal cooling of newly formed ocean crust that is formed by mid-ocean ridge volcanoes. 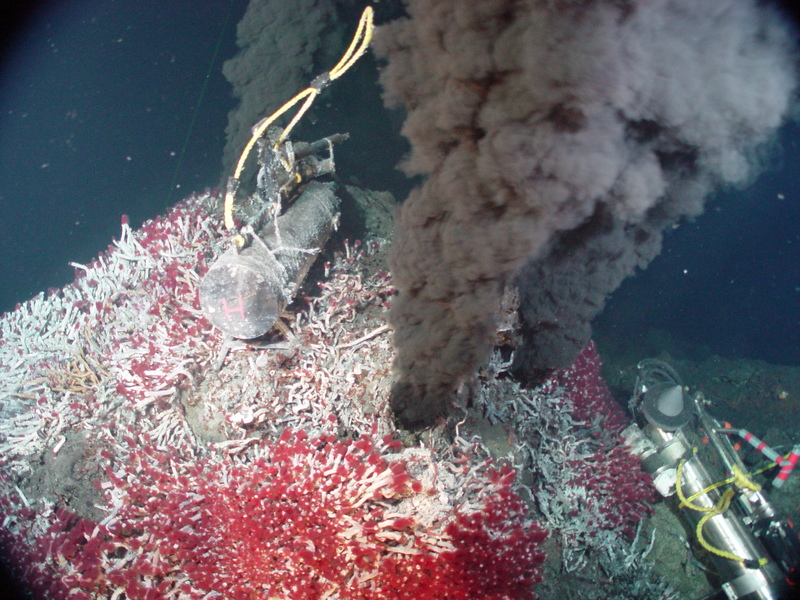 These systems continue to be the focus of extensive studies aimed at understanding the role that submarine volcanoes may have played in supporting early life on Earth. Earlier in my career, my group spent considerably time developing numerical models of hydrothermal circulation through oceanic crust. A numerical model of 2-layer circulation of a seawater layer over a brine layer developed by my former postdoc Fabrice Fontaine showing (top) temperature and (bottom) streamlines. 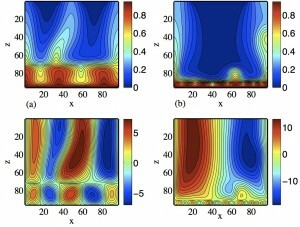 Numerical models have advanced considerably in recent years going from 2-D to 3-D, including finer grids to look at the details of vigorous flow and accounting explicitly for the effects of phase separation that leads to boiling at lower pressures and the formation of brine droplets at higher pressures. However it is not entirely clear that these models include all the essential physics and chemistry that controls these systems and the models are rather ad hoc in that they generally consider circulation in rectangular box with an idealized permeability structure (permeability is a measure of how easily fluids can pass through a rock). It is therefore important to develop conceptual models of these systems too and focus models on trying to explain observational data. One topic that particularly interests me is understanding how the base of hydrothermal cells interact with the magma chamber. 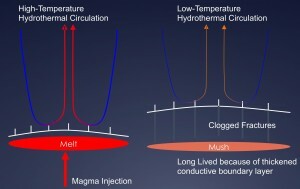 Earthquake data (see Earthquakes at Oceanic Spreading Centers) and modeling considerations suggest that vigorous hydrothermal systems are underlain by ongoing magma recharge that provides the heat to sustain high hydrothermal heat fluxes and the inflation to cracks the overlying carapace and thus allow fluids to circulate near the magma chamber and extract its heat efficiently. When the magma recharge ceases, inflation and cracking stops and hydrothermal alteration products rapidly clog fractures and slow hydrothermal circulation. 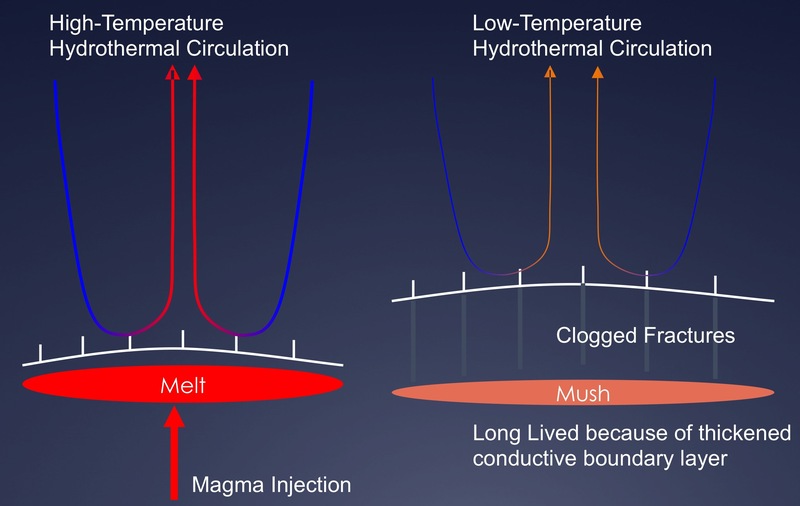 A thick impermeable insulating layer develops between the magma chamber and the hydrothermal cell and heat fluxes decrease dramatically. A magma chamber full of partially solidified mush can survive until the next episode of magma recharge. In the future I am really interested in developing new numerical hydrothermal models that explicitly take into account the geometry of the axial magma chamber determined from seismic observations and which use variations in the velocity structure to estimate 3-D changes in permeability.